Tri City Crating & Packing Inc.
At Tri-City Crating and Packing we provide our valued San Diego County clients with secure, reliable crating and packing services for motorcycles and automobiles. We have over 20 years of experience working with auto dealerships, auction houses, collectors and others, designing and fabricating custom boxes and crates for all makes and models of automobiles, motorcycles and their components. Whether you're shipping a classic automobile overseas or motorcycle parts across the country, our skilled professionals expertly manufacture each box, crate, pallet or skid to meet the exact specifications of your cargo. We will deliver your custom crate or box to your business or residence and pack your motorcycle or automobile on-site, at your convenience. Our staff of friendly, knowledgeable crating specialists offer free consultations, estimates and even on-site measurements and assessments. We have long-standing relationships with many shipping companies and can coordinate safe, efficient shipping at very competitive rates. 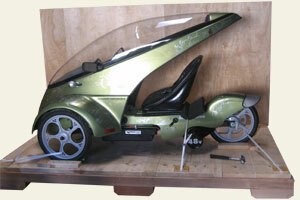 Call today for the expert all-in-one solution to your motorcycle and automobile crating, packing and shipping needs.